Back in the Sunshine State, and kitchen remodel pics. Yesterday afternoon, we arrived back at our home here in Florida, after two weeks away in New Jersey. 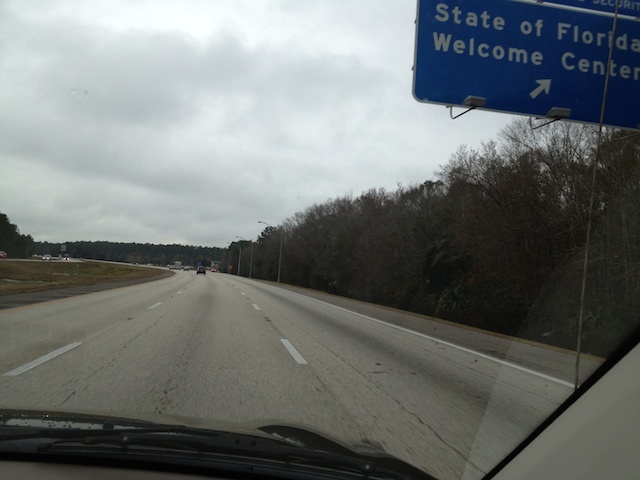 I was so happy to see my first “Florida” road sign along the way and to know that our three day journey was almost over. 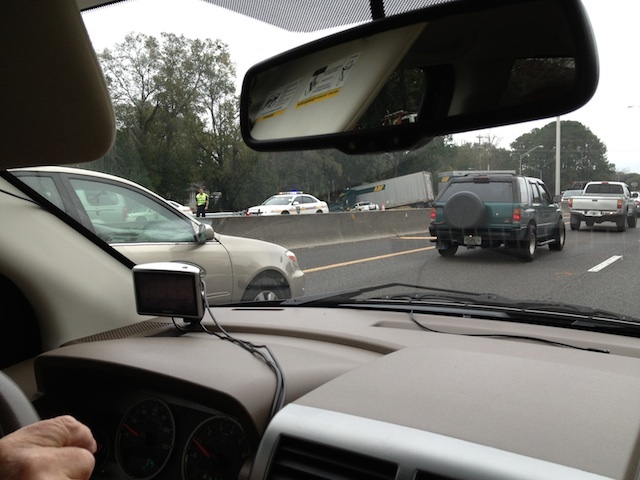 The drive was good, and we didn’t encounter much traffic, but when we got to Jacksonville, we saw that a truck had jack-knifed on the other side of the highway, blocking the entire road. 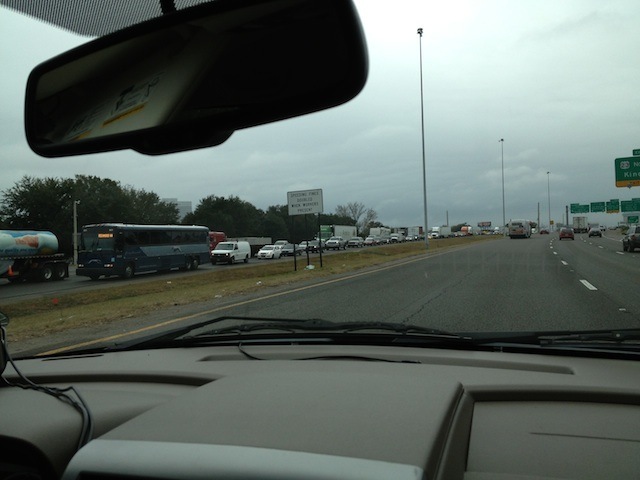 The traffic was backed up for literally miles and miles., and I was so thankful that we were going in the opposite direction. On Wednesday we’d stopped for lunch at ‘South of the Border’, a very colourful rest stop on the border between North and South Carolina. Unfortunately we didn’t have time to go in and see the Great White Shark. The weather started getting much warmer, the closer we got to home, and it was great to be back in the land of palm trees, blue skies and sunshine, and as soon as we got in, it was off with the warm clothes, and on with the shorts and flip-flops. When we got home, hubby resolved, with a little gentle persuasion from me, to move the light fitting in the kitchen, to centre it over the island. After he did the remodel, it was totally in the wrong place. This entailed going up in the roof of course, but he did it, and whilst he was up there, I had two phone calls for him. “Sorry he’ll have to call you back, because he’s in the roof.” I’ve got quite used to saying this over the years, as he has spent quite a lot of time either in or on the roof at our various houses, whilst doing renovations. Finally it was done, and I took a couple of photos to show you the new kitchen. We still have to do some tiling on the walls, and crown moldings around the top of the cupboards, and also install the stainless steel kick plates along the bottom of the cupboards, but that can only be done after we’ve laid the wood flooring which is nicely stacked in the study at the moment. We will start this tomorrow, and there is about 1,200 sq ft of it to lay right through the living area. Anyway, I did promise to show you some pics when the kitchen was finished, so here are the before and after pics. This was taken last year, shortly after we moved in, and before all our furniture had been delivered. We leave for a week in Belize next Thursday, so I don’t know if the floor will all be down by then, but we can resolve to try. To see more posts on the WordPress ‘Resolve’ theme, just click here. oh wow! that looks absolutely amazing – you said your hubby did it himself, with your help of course? So very true – would defeat the purpose! Wow, the kitchen looks great!! Good job to your hubby. 🙂 I’m sure you’re glad to be home and back into your routine. Thanks so much. He’s almost finished the new floor now, and it looks great. Ow, someone just mentioned about the “South of the Border” sign on my comments. Can he do my mom and pop’s kitchen next? Wow…you received a lot of comments! I’ll keep it short. 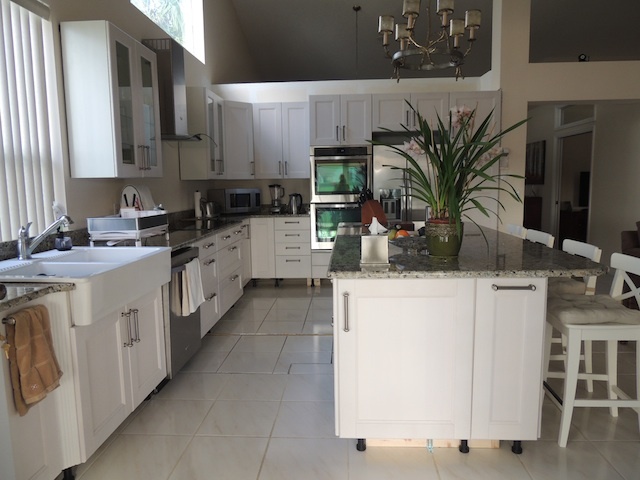 Nice kitchen remodel and I just returned from spending over a month in Florida on Dec. 10th. Loved it!! Thanks so much, Sherry. Yes, we love Florida too. Great kitchen. Awesome. I like white combination in your new kitchen. Stunning … kitchen … well done – some passion that has gone into it .. and he has done a fantastic job. My only worry is your sink .. had one like that, never again – the things you break when they fall over inside .. and the discouraging, so be careful with what you put inside .. and what you pour out. I really wish I had a big kitchen like that again, but I don’t cook anymore … so wasted on me. My give you a compliment for the position of your ovens – Perfect! You will never burn yourself again. It’s truly beautiful … Belfast sink. I’m glad … I will not get the chance to say … what did I tell you. *laughing Enjoy your new kitchen. 😆 I’ll tell you if I break anything. A perfect kitchen for a beautiful home. I always wondered what it would be like to live in the Sunshine state where you are close to the sea. Perhaps one day, fate will blow me towards that direction. Have a great weekend. 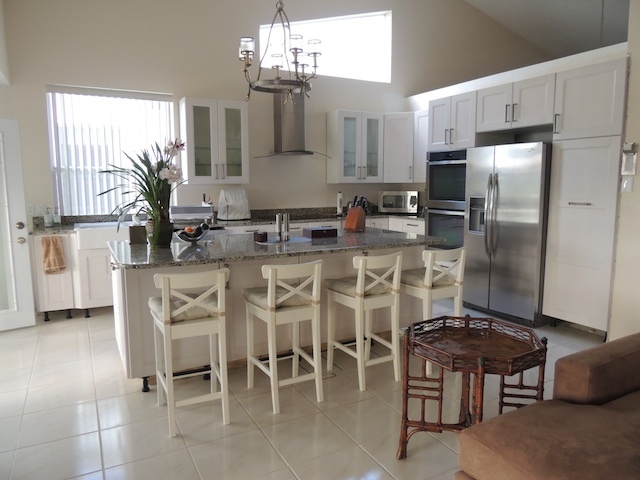 Wow that kitchen looks inviting….glad you’re home safe and happy. Your kitchen looks great. I used to live in Palm Coast, FL. I loved going to Jacksonville to shop. Thanks so much, Connie. I’ve never stopped off in Jacksonville, only passed by on the highway. Love, love, love your kitchen! Your new kitchen looks fantastic. We were in England for Christmas and New Year and like you it felt good to return home to the warmth and sun. Your hubby must be a fantastic man – with help from you of course! Beautiful kitchen – I love light and space. You utilised so much more space in the kitchen and it looks fab! I’m sure you are happy to be home and the kitchen looks great. Vast improvement on the kit rehab – much better flow/ functionality with the island and the french doors. Hope you get to enjoy it, Sylvia. Thanks so much for your visit and lovely comment. 🙂 Happy New Year to you. Glad to see you are both home safe and sound, the kitchen looks just gorgeous…..like out of a magazine….lucky you to have such a hubby who is so handy! This will add a lot of value to your home…. The kitchen looks terrific…I know you must love the change. We will be heading to Florida next month. Hopefully it will be sunny, last year it rained most of the time…the main thing is visiting family and friends. Lovely job! I’m in FL for the winter but Belize sounds far more interesting. Diving? 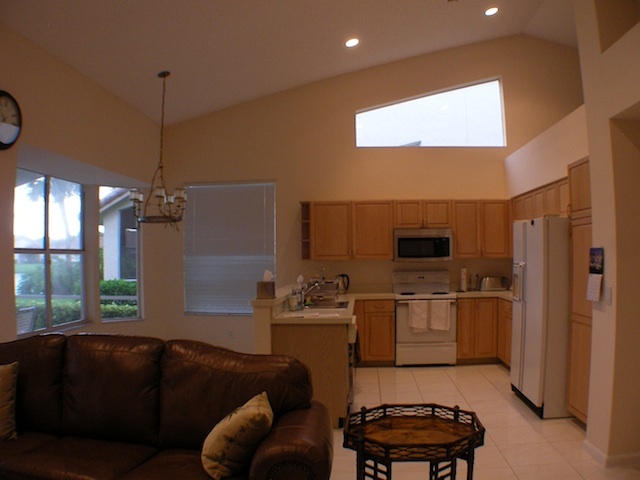 Beautiful kitchen – great job! beautiful remodel of the kitchen! I’m sure the fact that you all did it makes it that much more fabulous every time you step in the room! What a FANTASTIC space for a kitchen!!! LOVE IT so bright and airy!!!! CONGRATS!!!! Wow! Hubby did excellent work on the kitchen ad, I just love your new kitchen! Thanks so much, Hopestar. I think he’s definitely someone I should hang on to. 😀 Hugs. So, when are you having us all over to inaugurate the renewed galley? I love the new kitchen! Thanks for the before and after. Your kitchen is awesome, wow. So large and spacey, I love it. Compliments to your hubby and yourself. 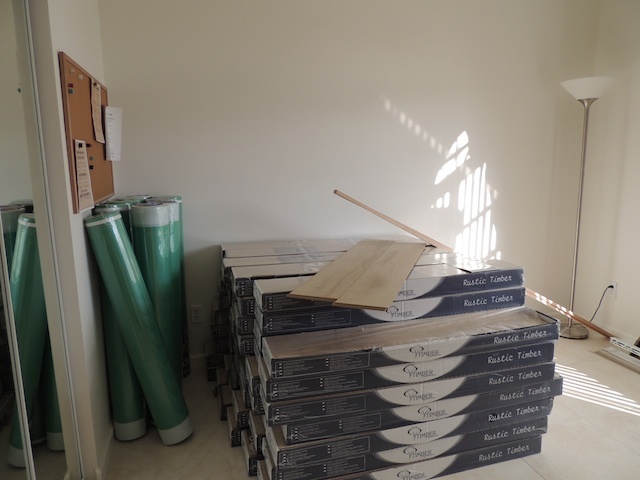 The wood flooring will make it even nicer! http://postadaychallenge2011.com/2013/01/05/weekly-photo-challenge-resolved/ when I saw your photo of the wood floors you are doing I am doing this too. New year new look! Lovely kitchen – so light and airy. Good luck with the flooring, AD. I haven;t seen stainless steel kick plates here yet. Excellent idea! Absolutely love the job that you both have done in the kitchen, looks fabulous, and plenty of room and cupboards, very nice. 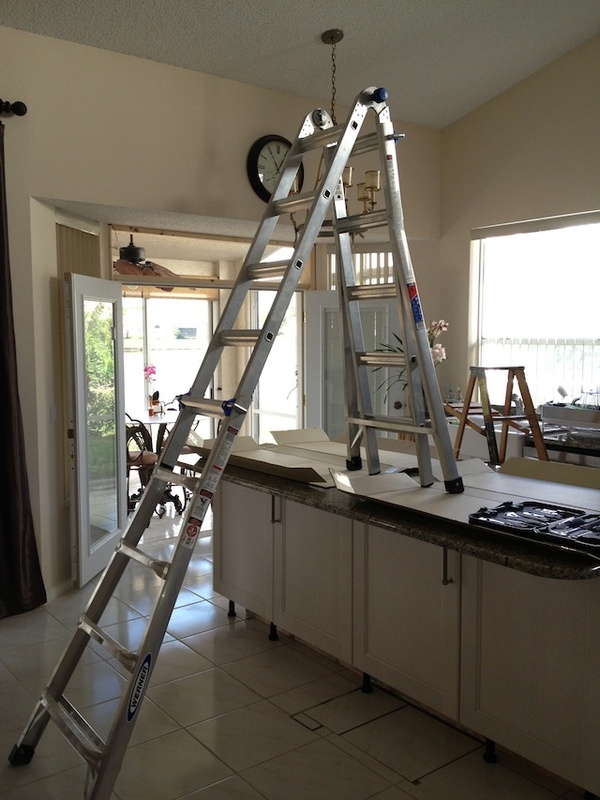 Your kitchen is beautiful…and I love your ladder…I will be looking for one of those at the local hardware store in the very near future! Thanks so much, Jeanne. He really loves this ladder. It’s so versatile compared to the one he has in South Africa. Awww… so beautiful and light and airy. Great job by both of you! I don’t suppose you’d want to loan your hubby out? My entire house has a tile floor. I am seriously considering replacing it with laminate flooring. That’s what I had at the previous house and I loved it. The tiles are a major pain in so many ways. I can well imagine. Lucky you to have him all to yourself! Queensland is called ‘The sunshine state’ in Australia and it is very hot and sunny right now. It looks wonderful and so much lighter. Well done, C (and AD from time to time). Dutchmen (and women) think alike. 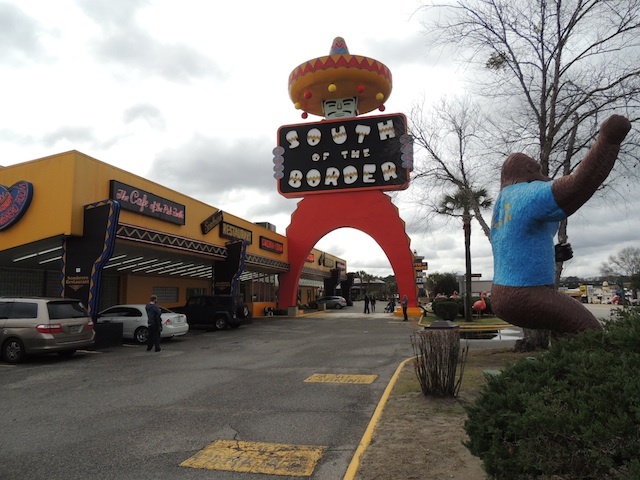 What’s that thing on the right side of the South of the Border pic – is it a ape in a blue tee-shirt? LOL – or am I just blind? Welcome home…..glad you had a safe trip! Looks very nice and professionally done.